Read the latest volume of Talent Tech Labs' trends report which focuses on candidate experience including an evaluation of its current state, why candidates continue to be unhappy with their hiring interactions, and what companies can do to improve the process. This edition also highlights where and how AI technology is changing the way employers can deliver a more positive candidate experience. The report is complimentary and can be downloaded on their site. 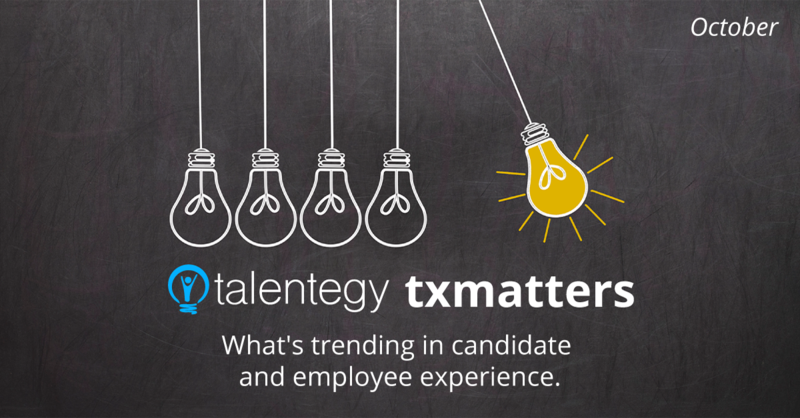 Talentegy is very proud to be a sponsor of such an inspiring organization truly dedicated to optimizing and measuring candidate experience across the globe. We had the pleasure of gathering with hundreds of HR and Talent Leaders at Talent Board's Nashville Awards Gala celebrating the 2017 North American winnners. For the full list of the Candidate Experience (CandEs) Award winners, refer to their press release. Recruiting Brief offers up the 50 recruitment statistics that everyone in HR should know. Lots of research stats to keep even the biggest data geek happy. They cover candidate experience rankings as well as salary, HR technology, mobile and beyond. My favorite stat: 52% of people reportedly searched for a new job while in bed reminding us once again of the importance of a mobile first approach to your career site and talent technology interactions. Sources include Gartner, Bersin by Deloitte, Jobvite, MRINetwork, Glassdoor and more. The hackathon, once only used by IT, is now being reinvented to improve both the candidate and employee experience. At the heart of the HR hackathon is the application of design thinking to see the world through an employee's eyes or an applicants. Hackathons are now being used inside forward thinking HR functions to re-imagine the user experience attached to their talent functions. For company examples and how they are implementing new best practices, read Future Workplaces' Forbes article. Candidate experience has never been more important then it is today. There’s a major shift happening in how people (especially the new generations of workers) look for jobs. Today’s candidates discover employers the same way consumers find restaurants, AirBnBs or even doctors: searching online and getting recommendations. Marketers need to communicate with candidates, not only customers, and recruiters need the same know-how as marketers to break through the noise. Join the community and see how we can all share in becoming better brand stewards and candidate experience champions. It's a shockingly true statistic. With all the money an employer spends on creating a career site, buying technology to help manage and communicate with candidates, and then sometimes oodles of other widgets layered on top to fill gaps, over 60% of their candidates still abandon the application process midstream. While plenty of analytics platforms can give you stats, many can't give you the why. And it's worse for Staffing and Recruiting Firms. Read Echogravity's take on how to keep your candidate pipeline happy and full. They also have a great ATS Buyers Guide. Virtually everything you do as a recruiting organization points potential candidates to your career site. Whether it’s the job ads you place, the emails you send to candidates or the events you participate in, candidates end up on your career site, either researching or applying for jobs. Check out Survale's blog about how increasing your application conversion rate by just by 1% can save you literally hundreds of thousands of dollars. It's scary how quickly the numbers add up. On a personal note, I saw my first Director of Talent Acquisition, Branding and Candidate Experience job posting the other day. We may finally be realizing the potential it plays on a company's bottom line. Would love to know if you have seen other companies using it outside of lumping it in with Employer Branding responsibilities.